Bon Appetit! The Big Skies team is proud to announce our newest event - The Chef's Table - and you're invited! This suit and tie showcase will highlight local produce to create a sophisticated culinary experience sure to wow everyone. Bon Appetit! The Big Skies team is proud to announce our newest event - The Chef's Table - and you're invited! This suit and tie showcase will highlight local produce to create a sophisticated culinary experience sure to wow everyone. Treat yourself to a five-course gourmet feast celebrating the flavours of the Western Downs, exclusively designed by celebrity chef, author and television presenter Ben O'Donoghue. Spend the afternoon under a canopy of trees in the ultimate dining experience and enjoy the exquisite tastes of the region with sommelier-matched wines specifically chosen by wine connoisseur Des Houghton. So pull out your classiest party frocks and stylish suit and ties, this event is not to be missed! Is your bucket list full of unique experiences? Are you curious about the ins and outs of solar and wind farms? If you’re looking for that authentic rural experience then we’ve got the event for you! From solar and sorghum to cattle and cotton, the Western Downs is known for its successful agricultural and energy industries and now, Big Skies is giving you the chance to get behind the scenes with exclusively chartered regional tours! Join us as we explore history and step inside some of the leading trades, businesses and industries that contribute to our innovative region. Across ten guided journeys, we've included tours of museums, leading international businesses, cotton and sorghum farms, feedlots, the Chinchilla Botanic Parklands, solar farms and even the site of what's set to be Australia's largest wind farm - all within the Western Downs! There's something for everyone whether you’re a local or a visitor so click the link below to find out more about the perfect tour for you. Are you coming to Day on the Plain but not sure where to stay? 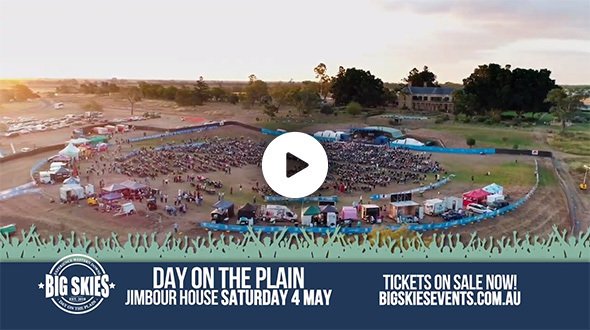 After the best night of classic Aussie rock, why not sleep under the stars on the Jimbour Plains? Our camping options were so popular last year so we've extended our capacity for campers to around 1,500 sites. So get out the swags and camping gear or get your motor homes ready and enjoy the camping lifestyle. Why not come along a few days before the big concert and check out our Camp Bonfires, Breakfasts, Outdoor Cinema or Camp Oven Experiences in the exciting Big Skies week? We'll see you there!